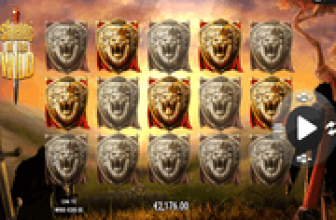 Dragon Born online slot by Big Time Gaming/NextGen Gaming furnishes 117, 649 Megaways to win on matched-symbol groupings landing as outcomes of a paid or bonus spin. 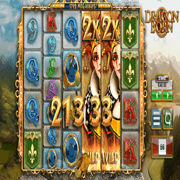 Images of a quaint Dragon-like being, and of royals and objects related to monarchy, appear as elements of a 6-reel slot game. The number and size of tiered icons coming into view in each reel vary, a design aimed at enhancing opportunities of reaping rewards on consecutively appearing identical symbols. A Dragon Born reel may produce up to seven (7) singular images, or two large-sized icons, or even a full-reel image, creating a colourful collage of reel elements. The Wild Symbol for one constantly appears as a full-reel image, equivalent to a stack of seven (7) regular-sized symbols. The Scatter Symbol on the other hand, always emerges as a single regular-sized icon that can form a winning combination free of restrictions. Yet generally, identical symbols whether emerging as single tiles, 3-tile or 4-tile high large images, are evaluated as wins for as long as the totems are positioned in adjacent reels. A pleasant-looking Court Jester takes form as Wild Reel Symbol. The image though, occurs only in Reels 2, 3, 4, 5 and/or 6. At times and via single spin, the Court Jester full image may simultaneously emerge in two (2) reels. On top of its substitution feature, a win-multiplier ranging from 2x up to 7x may be affixed to an emerging Wild Reel. When two Wild Reels with Multipliers are in view, the factors displayed multiply; thus increasing the value of the win multipliers. A multiplier applies only to consecutive symbol groupings that made use of the Court Jester Wild Reel as alternative icon in completing a winning arrangement. A true-to-life image of a bright, sparkling Diamond represents the Bonus Game Scatter icon. Three, four, five, or six Diamond Scatters altogether taking position in any reel, or row, trigger the launch of the Dragon Born free games. The extent of free-spins awarded depends on the number of Diamond icons constituting the triggering Scatter Symbol combination. To which 6, 12, 25, or 50 bonus spins are awarded accordingly. During the free round, every Diamond Scatter displayed by any reel triggers one (1) additional bonus spin. This denotes that the greater the number of such image in view, the more bet-free spins added in extending the bonus round. According to the Dragon Born Game Info, a single bonus-spin could produce as many as five (5) Diamond Scatter images. The info also states that an unlimited number of spins could be reset in a single round of free games. All Megaways-to-win are covered by every bet staked per spin. The Betting Options are stated as wagers ranging from 0.20 up to 200.00 per spin. Since there are more than a hundred thousand ways to win, the related payouts on every winning symbol combination are stated as cash value equivalents. Dragon Born is a Big Time Gaming online slot deployed at online casinos powered by NextGen Gaming, to furnish 117,649 Megaways of winning on adjacently positioned identical symbols. 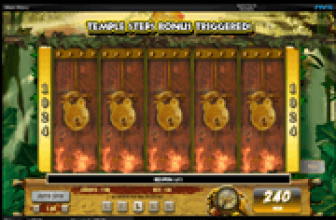 The game also features a full-reel Wild Symbol constantly emerging as 7-tile high Wild Reel, whilst randomly displaying Win-Multipliers ranging between x2 and x7.